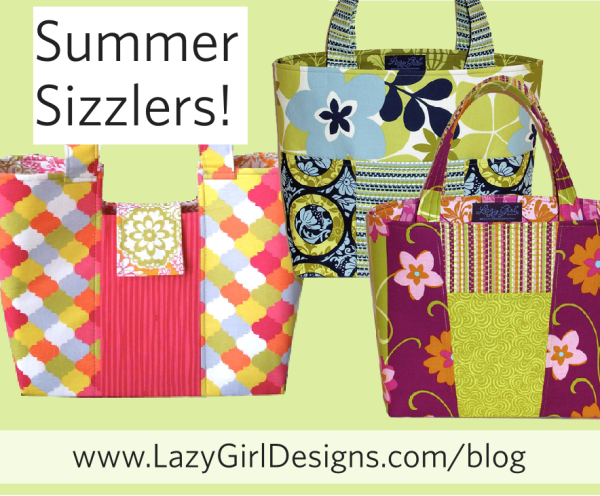 Lazies, Here are three of my favorite, quick and flirty bag designs. For some reason, I’m just drawn to Claire, Gracie and Whimsy. 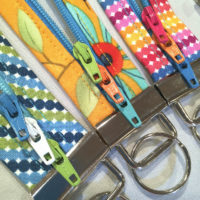 They are all quick to make, wonderful for bold prints, and full of personality. Quick and easy patterns, perfect for a Lazy summer afternoon. They are also now available as PDF e-Patterns! Claire is the queen of ‘Stack, Chop, and Swap’. In this sample, cut rectangles from the floral and the tiny stripe. Then stack them, cut into three pieces and swap the middle panels with each other. 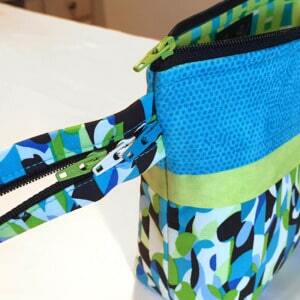 Sew together with a simple pocket, shown in the limey green fabric, and the front/back of the bag are done! The panels are cut at a slight angle for a dynamic finish. 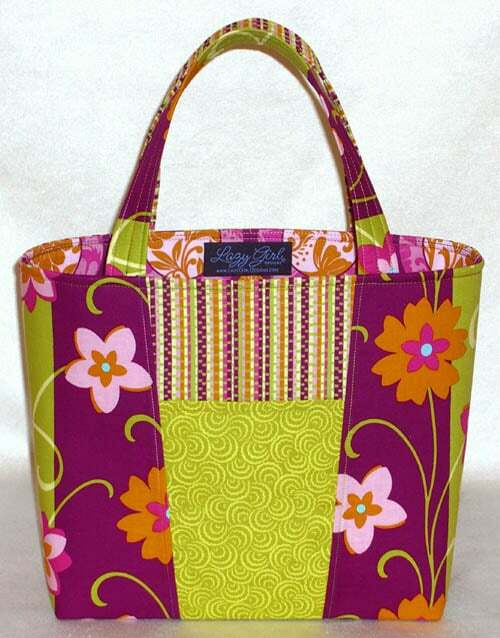 This open top tote is perfect for a tote-style purse or a project work bag for knit, crochet or other crafts. My love for Gracie knows no bounds. That’s a big statement, I know, but I truly do love this little girl. Why am I so smitten? This design is like poetry in motion for me. It’s fun, harmonious, and quick to make. And it is full of convenience and it’s easy to use. Cut and sew panels together for the outside of the bag, leave the middle one shorter. That little dip makes it easy to sling over my shoulder. 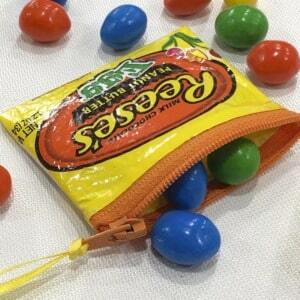 The top of the bag is open on either side of the flap so I can easily reach in and grab something. Those openings are also a great place for a bottle of water. Video demo and more about Gracie here. Whimsy is absolutely one of my quickest bags to make. 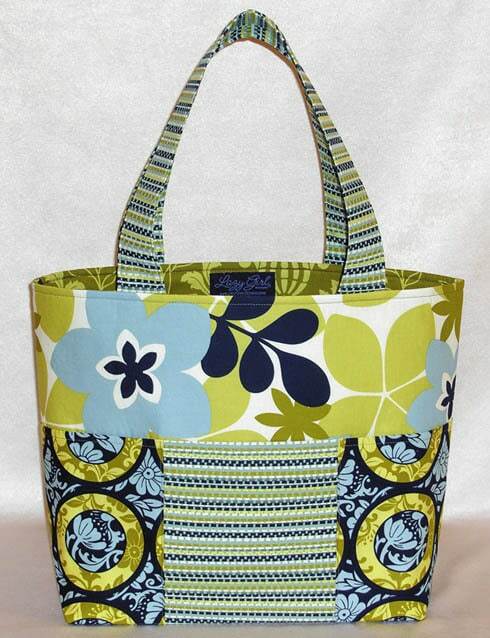 She is a simple style tote with pockets on the outside. 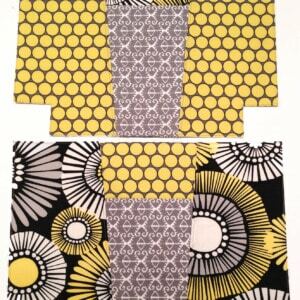 The three panels shown here in circle and stripe fabrics are the outside pockets. Whimsy is a great all-purpose tote, perfect for a day on the go. Load her up with a project, your favorite reads, or all that extra stuff that won’t fit in your purse. 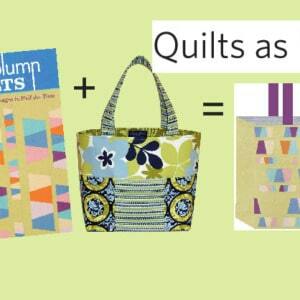 All three bags use a few fabrics and are perfect for fusible or sew-in fleece. I especially like our Stiff Stuff Firm or Dreamy Fleece (fusible or sew-in) for all three designs. 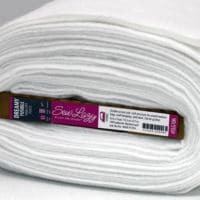 What ever you choose for batting or fleece, I recommend a low loft product that can be stitched up to 8″ or more apart. These designs include sewing through several fabric and batting layers, so keep that in mind when selecting supplies.Thin is in, baby! And that helps with ease of construction during those final seams sometimes. 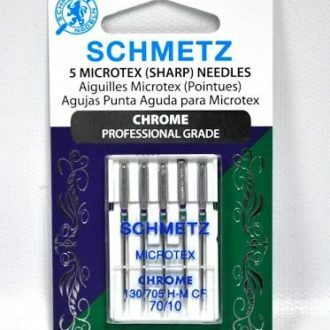 As always, I like a walking foot and a size 80/12 or 90/14 sewing machine needle. Gracie, Claire and Whimsy recently joined my other downloadable patterns available in our pattern store at the button below. Sew up some summer sizzle at your sewing machine – pick out some vibrant fabrics and give one of these quick designs a try. 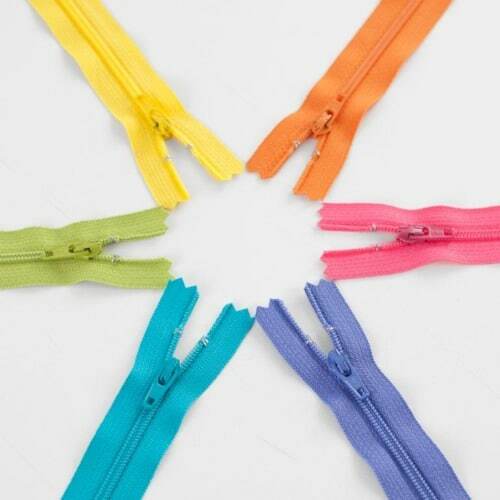 Where do you get your terrific fabrics? Love the summer bags. Also here’s a suggestion for fabric – my daughter loves pink camo, so I made her a Miranda in pink camo with bling on the flap closure — she just loves it too. 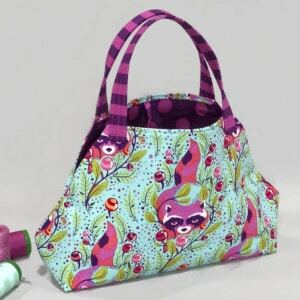 Keep up the good work, these bags are fun to sew and very pretty. 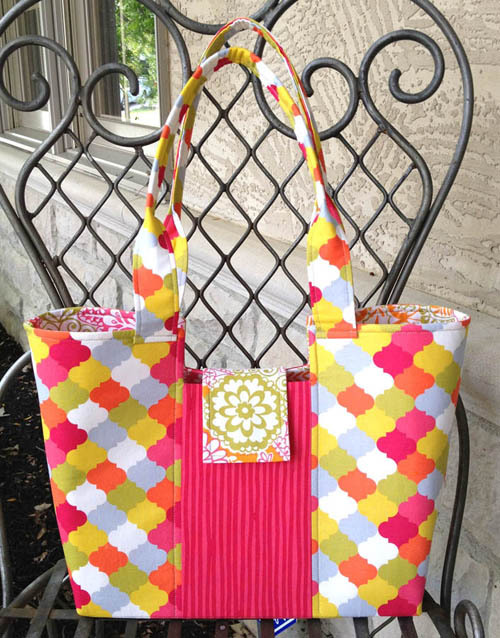 I love the bright, bold fabrics and the bags! Love the bright summer versions of these all-star patterns. I’m taking Claire in blue batiks on a summer trip tomorrow. I have to say that I was rather disappointed with the pattern instructions supplied with the Gracie Handbag. 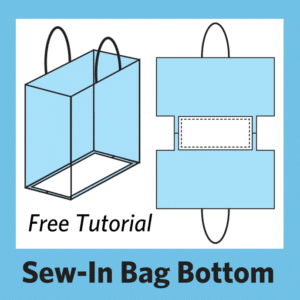 While I sew well enough to understand directions, for the price you charged for the pattern it seems you would at least have printed the instructions in color, or sent pattern pieces to cut out to make the purse easier to put together. While I realize you have a “How To Video,” on YouTube, it is not convenient to try to use the instructions you sent along with the video. The purse would have been so much simpler to put together if you made your pattern the way Simplicity, McCalls and other companies make their patterns. I also think that $3.50 for shipping and handling was a bit much, considering it only cost .70 cents to mail the pattern instructions. I doubt that I will be buying anymore of your patterns under the circumstances. Sure love the Claire handbag and plan on making it. 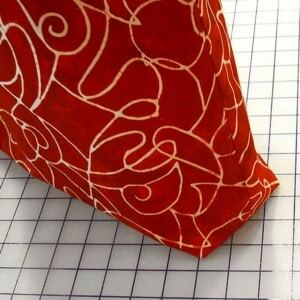 Love that fabric, can you tell me the designer or name of the fabric? Thanks, appreciate all your help and your fun patterns.